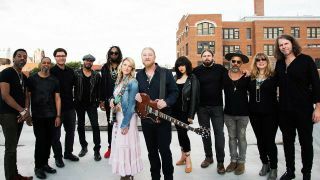 Tedeschi Trucks Band have released They Don’t Shine, the second song to emerge from their upcoming Signs album. Released on February 15, Signs is the follow-up to 2016's Let Me Go By. Available to pre-order now from Snakefarm Records/Fantasy Records, Signs was written by all 12 members of the band, and recorded in Tedeschi and Trucks' backyard studio, Swamp Raga, in Jacksonville, Florida. Also starring on the album are Warren Haynes, Oliver Wood and Doyle Bramhall II. The album was written and recorded following a series of tragic losses for the band, including the death of Derek’s uncle and Allman Brothers member Butch Trucks, mentors Leon Russell and Col. Bruce Hampton, and Gregg Allman. Tedeschi adds: “We are very lucky to do what we do, and we take responsibility for creating something positive to counter all the negativity. Tedeschi Trucks Band released Hard Case last month. The band are currently on tour in the US, before heading to Europe in April. The tour includes two nights at the iconic London's Palladium (both dates are sold out). Tickets for all other shows are on sale now.